When you have kids you churn through a lot of shoes. It seems like we are always at the shoe store getting new shoes because those feet just keep growing. We always let the boys choose their own shoes (within reason) and my youngest decided he wanted to get some hiking boots because they were water resistant (think puddle splashing here). 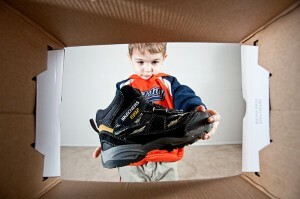 For this shot I wanted to get the perspective from inside the shoe box. I cut out the back of the box so I could shoot through it. I used my 17-40 f/4L on a Canon 5DII to get a wide angle shot that would do two things: first it would get the entire inside of the box in the frame and second it would distort the shoe and make it look much larger than it really is. For lighting I had an overhead bare light, a bare light behind the camera and box, a Canon 430 EXII to camera left on 1/2 power with a Lumiquest Softbox III attached, and a Canon 580 EXII in a shoot through umbrella to camera right. The most difficult aspect of this shot was getting my son to cooperate. He actually did quite well and we shot 130 frames total. This was by far my favorite and amazingly was taken at the end of the shoot when he was starting to get bored. You can see others from this shoot on my Flickr site here.